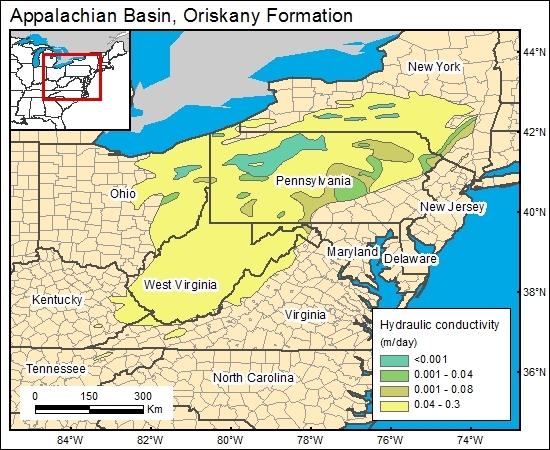 Because of the high potential (in some areas) for natural gas production in the Oriskany Sandstone, there are a large number of reports, articles, and theses that report permeability in this stratigraphic interval (Headlee and Joseph, 1945; Harper and Patchen, 1996). Moreover, there are many geophysical logs available for the Oriskany Sandstone interval from which formation permeability can be calculated (Asquith, 1982) if a more detailed assessment is desired. For the GIS, we combined the sand/shale/limestone map of Diecchio and others (1984; their fig. 4) with permeability information from Headlee and Joseph (1945) and Harper and Patchen (1996) to characterize permeability distributions of the Oriskany Sandstone. Permeability was converted to hydraulic conductivity. Asquith, G., 1982, Basic well log analysis for geologists: Tulsa, American Association of Petroleum Geologists, 216 p.